Although the solar energy sector is making strides with homeowners looking to cut their energy costs, solar stocks have been notoriously volatile. They lagged the market for years until something changed for the better in 2017. As the stock market often does, it waited until nobody was looking before offering up an explosive move higher. Nobody was looking in April of last year, and solar stocks very quietly started to recover. In fact, the Invesco Solar exchange-traded fund (NYSEArca: TAN) is up nearly 22% since then. Exposed: Energy insider reveals most important financial event of the decade – or possibly of the century. Click here to learn about four potentially lucrative profit plays. Bloomberg just reported that solar energy makes up 55% of all new energy generation, blowing past wind and natural gas for the second straight quarter. That's even with the new tariffs in place. Plus, this isn't an anomaly. Germany just broke a national record, getting 85% of its energy from renewables during the May 1 weekend. That's according to CleanTechnica, a global cleantech-focused website. 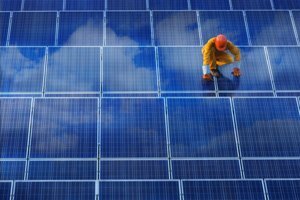 Solar power costs are dropping steadily: it's cheaper than natural gas, according to the U.S. Energy Information Administration (EIA). Unlike natural gas or wind, it has almost no environmental side effects. Trendsetting California will require solar panels on all newly built single-family houses after 2020. Industry growth is still in the early stages. The EIA projects U.S. solar energy production could grow 500% by 2040. Simultaneously, Wood Mackenzie projects China's growth could be 700% by 2035.